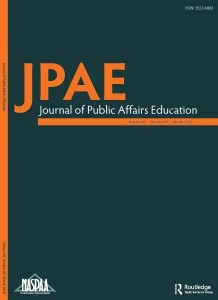 The Journal of Public Affairs Education (JPAE) is dedicated to advancing teaching and learning in public affairs, which includes the fields of public policy analysis, public administration, and public management. Hosted by the Department of Public Administration at NC State University and the Department of Political Science at Augusta University, the quarterly journal features peer-reviewed scholarly articles on pedagogical, curricular, and accreditation issues pertaining to public affairs education, commentaries, symposia, and book reviews. JPAE is the official journal of the Network of Schools of Public Policy, Affairs, and Administration (NASPAA).